The team at Medical Doorway found themselves supporting a record enrolment at Medical University Pleven in the February 2016 enrolment. With over two hundred students commencing their studies, the team were on site to assist students with their arrival into Sofia, transfer to Pleven and finalising accommodation in the beautiful northern Bulgarian town. Medical University Pleven was the first university in Bulgaria to commence teaching in English. This unmatched reputation has meant students from all over the world have enrolled this year. Medical Doorway assisted students from the UK, Ireland, Netherlands, Belgium, India, Kenya, Nigeria and Zimbabwe. As usual, students enjoyed the premium service provided FREE of charge by the Medical Doorway. Most students arrived on 30th January and the team were at Sofia airport all day to meet students and get them on our exclusive coaches to Pleven. 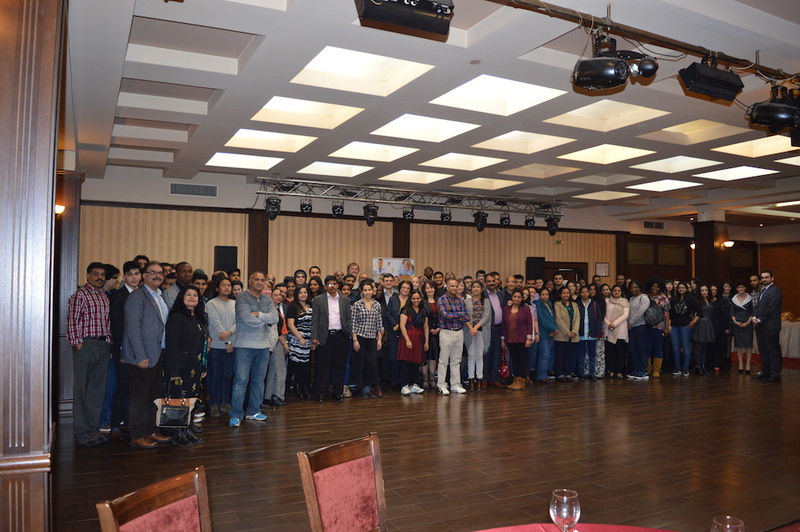 On Sunday 31st January, Medical Doorway hosted a welcome reception at the centrally located Hotel Rostov. The event was attended by the university’s governing body including the Rector of Pleven Medical University, Professor Dr Slavcho Tomov. Professor Tomov gave the official welcome to the new students and their visiting guests. Ben Ambrose (Managing Director) gave official thanks to Vice-Dean Professor Angelina Stoyanova and the admissions staff of MU-Pleven for their dedicated work in supporting students. A welcome was offered by the Mayor of Pleven and the Pleven Folk Ensemble offered a thirty-minute performance of traditional Northern Bulgarian song and dance. The event was covered by national print and television media who were keen to speak with students, the university management and members of the Medical Doorway team. The event also including a signing ceremony to officially announce a new and exclusive partnership between Medical Doorway and Medical University Pleven. While the new students now move onto their orientation programme, Medical Doorway is already receiving applications for the February 2017 enrolment at Pleven Medical University. Interested students can download the application form from the Medical University Pleven section of our website. Alternatively, e-mail the team at [email protected] or call our office on +44(0)1782-898151. Study Medicine in Bulgaria with Medical Doorway.